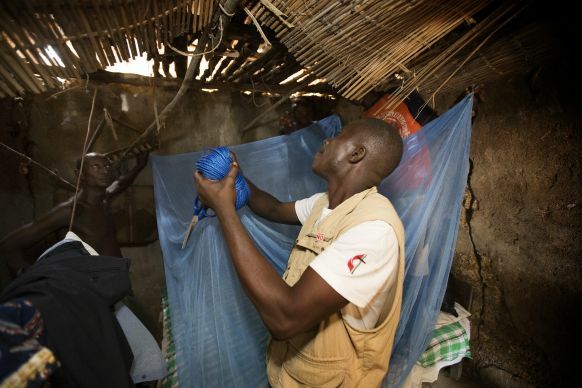 Ernest Jusu, a nurse working with The United Methodist Church's Imagine No Malaria campaign, helps hang a new, insecticide-treated mosquito net at the home of Peter Braima in Manjama, near Bo, Sierra Leone. Last June, the Northern Illinois Annual (regional) Conference accepted a motion to raise $1 million forImagine No Malaria, the comprehensive effort by The United Methodist Church to eradicate death by malaria on the continent of Africa. Just one year later, the conference is close to surpassing that goal. During the June 8-10 annual conference session, a bishop’s appeal offering of more than $42,000, a $10,000 donation from The Seoul South Annual Conference of the Korean Methodist Church and other donations helped boost the $811,000 already raised to $868,000. Bishop Jun Taek Lim of the Seoul South Annual Conference, Korean Methodist Church — along with his wife and nine district superintendents — visited the conference to personally deliver the $10,000 donation to the campaign. Seoul South is the Northern Illinois Conference’s sister conference. Lim said malaria was eradicated in Korea several decades ago and he’s saddened that other parts of the world still struggle with the disease. “We are so glad to be part of this contribution with our sister conference with whom we are in mission together,” he added. At the 2013 Annual Conference, Northern Illinois Bishop Sally Dyck challenged churches to raise $100 for each person who regularly attends worship. As the 2014 annual conference began, the total amount pledged and raised was at $811,000 — $711,000 of which was from multiyear fundraising goals set by 107 churches in the conference. Churches got creative in their fundraising efforts, generating donations with tried-and-true staples like chili dinners, lemonade stands and cookbook sales; sporting events like dodgeball tournaments and basketball shootouts; as well as filling bottles of water with dimes and partnering with the Chicago White Sox and local businesses. The most common pledge for churches in the conference was $5,000 over three years. More than 22 churches pledged more than $10,000, with the highest pledge — $75,000 — coming from Christ United Methodist Church in Rockford. All money raised by the conference will be turned in by the end of 2016.